The Town of Rochester does not have a public library. Rochester residents are welcome to use libraries in Ellenville and Stone Ridge. history to 1893, when it was chartered as a school district public library. periodicals, newspapers, audio-visual materials and databases. please call (845)647-5530 or visit eplm.org. The Stone Ridge Library is tucked into two connecting historic stone houses and offers an on-site inventory of books, tapes, videos, records, periodicals, large print books and a local history collection. The library is a member of the Mid-Hudson Library Association and benefits from an inter-library lending program. As a community center, it features a children’s story hour, an adult lecture series, a Brown Bag Boutique and a community meeting room that features changing exhibitions of local artists’ work. The library publishes a quarterly members’ newsletter that contains library news and book reviews. The annual Library Fair in the spring is a popular fundraising event. There is an annual fee for Rochester residents to use this library. The beginning of the Museum and library of local history and genealogy in the Town of Rochester goes back almost twenty years, when a small group of volunteers banded together to preserve the historic heritage of the Town. Friends of Historic Rochester was incorporated in 1988 and the group began collecting historical data and artifacts at that time. The Museum and library building, located at 12 Main Street, Accord, NY, is named for two of the original prime movers of Friends who strongly promoted the establishment of a museum for the Town: Percy W. Gazlay and Eleanor S. Rosakranse. In 2005, the Museum acquired the extensive Eleanor Rosakranse Genealogical Research Collection which is comprised of hundreds of books and documents. Mrs. Rosakranse spent nearly fifty years in genealogical research and bequeathed her collection to the Museum upon her death. Also featured at the Museum is a “picture wall” covered with 8”x10” prints of old-time local postcards and photographs of buildings, people, and events; about 300 pictures so far and we are still soliciting more. We can scan and immediately return the originals to their owners, although we do have originals that were donated directly. Additionally, other items of interest at the Museum include: oral histories recounting the “Old Days and Ways; copies of the Cemetery Book, an inventory of the more than 70 cemeteries in the Town; full sets of The Accordianwhich has been published quarterly since 1989; numerous volumes on local history; and, notebooks with photographs and written material on many historic assets of the Town – stone, frame and brick houses, barns and other outbuildings, railroad stations, churches, and one- and two-room schoolhouses. The Museum is open every Wednesday from 12 noon to 3 p.m. for use by genealogical researchers. A local genealogist with over forty years of research experience is usually present at these times. The library has the Friends computer data bank of tens of thousands of names of genealogical interest which is available during these hours. This data bank is focused directly on the Town of Rochester and Ulster County families, and is a great research tool referencing sources and connections. The Little Ones Learning Center (LOLC) is a free early literacy program, with books to lend, operated by the not-for-profit, Friends of Little Ones, Inc. It is the mission of Little Ones to bring the joy of reading to children and to improve literacy in the home. All the recent research on brain development emphasizes the importance of a literacy-rich environment starting at birth for maximum brain development. Early literacy experiences provide a foundation for later success in school. The program is geared for children ages 0-6, but is open to all. Often children who have entered school come back to visit. Little Ones rents space in the Rochester Reformed Church on Route 209 in Accord. Three two-hour story times, led by an early childhood specialist, are held weekly. These story times are held on Tuesday, Wednesday and Saturday from 10 AM to Noon. Following story time, which often includes songs, rhymes, puppets and finger stories, fun and relevant hands-on projects support the day’s theme and enhance the understanding of the books which were read. Following craft time, free time is allowed for creative play, interaction of children and adults, and individual reading. A most important feature of our program is parent-child interaction, as parents/caregivers are required to stay with their children. A literacy-rich environment that nurtures a close relationship with caring adults is a conduit to interactive reading and creative home activities. In the last three years, there have been over 3,500 visits to Little Ones. Approximately 3,000 books are available for loan to promote literacy in the home. Over 5,000 books have been circulated in three years. LOLC encourages continuing participation in our program. The Little Ones Learning Center sponsors four to six special events during the year – some on site and others in the community. These events integrate, extend, and add a new learning dimension to our regular programming. LOLC often partners with other programs or businesses in the area. Two of our favorite special programs are Truck Day on site and Story Time At The Farm. For example, 15 businesses bring their trucks for Truck Day to allow children to climb on and in them. This enhances their understanding of the trucks they see in books and in the community. For more information, please call 626-4112 or visit our website at littleoneslearningcenter.org. 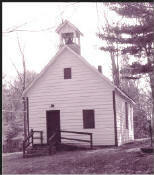 The Palentown Schoolhouse Museum is located on Palentown Road (off of Route3/Samsonville Road, Kerhonkson). A schoolhouse may have been built on this site, as early as the 1830’s. A deed dated 1851 refers to the property as Philip’s Meadow and leases it to the common school district #10. According to family members, the present building was constructed by Horace Dymond in the mid 1860s on land donated by the family. In September 1988, the schoolhouse was designated a State and National historic landmark. The 300 pound school bell, still remains in place on the roof. The window shutters replicate the design of a shutter found in the woodshed attic. A small group has formed to protect and care for this historic treasure. Volunteers are welcome and needed.